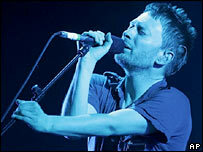 Radiohead frontman Thom Yorke has said releasing latest album In Rainbows solely on the internet would have been "stark raving mad". Yorke told BBC Radio 4's Today programme that 80% of people still buy physical releases and it was important for the band to have "an object". The album - released via the band's website for whatever price fans wanted to pay - was released in October. A physical version - on CD and vinyl - hit record stores on Monday. Early sales figures showed it heading for number one in the album chart, although it was only narrowly outselling Take That's Beautiful World, industry weekly Music Week reported. Yorke said the band would have been "mad" to ignore a physical release, which is being distributed by XL Recordings. "We didn't want it to be a big announcement about 'everything's over except the internet, the internet's the future', 'cause that's utter rubbish. "And it's really important to have an artefact as well, as they call it, an object," the musician added. Yorke told the programme the band decided to release their seventh studio album independently after 16 years with EMI imprint Parlophone. 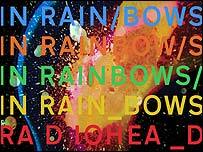 The decision to allow fans to pay what they wanted - including downloading it for free - made In Rainbows one of the year's most talked-about records. The experiment has now ended. "We have a moral justification in what we did in the sense that the majors and the big infrastructure of the music business has not addressed the way artists communicate directly with their fans. "In fact, they seem to basically get in the way. Not only do they get in the way, but they take all the cash," said Yorke. Yorke rubbished reports that the album was downloaded 1.2 million times in its first week alone - but refused to confirm any figures. "It's total nonsense. Thanks very much - we're the only people who know, and it feels wrong to say exactly what happened. But it's been a really nice surprise and we've done really well out of it."